Get the Right Diamond at the Right Price!™ Click on the shape below to see what's available. On most other websites, the loose diamonds for sale are inventory that’s not even owned by the business. Gain peace of mind by working directly with a jeweler who owns the diamonds and is invested in your satisfaction. At A. Fishman & Son, you can buy loose diamonds at remarkable prices and receive one-on-one assistance. We specialize in fine to excellent loose diamonds. Their qualities range from D to M Color and from Flawless to I1 Clarity. 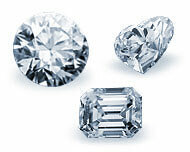 We help you buy loose diamonds that are finished properly and free of noticeable blemishes. Our diamonds, even the lower-grade ones, have polished and faceted girdles, which adds to their brilliance - and all of our diamonds are absolutely clean to the naked eye. We never sell fracture-filled or enhanced diamonds! The word “enhanced” often describes fractured diamonds with filled-in cracks. Don’t be misled concerning their clarity. They tend to have originally graded clarity in the I3 and rejection range. Also, the filling process is not permanent. There’s a danger the diamond will shatter. Remember, with A. Fishman & Son you can purchase loose diamonds that have been specifically selected for quality and offer a range of budget options. Read Diamond Clarity Enhancements. Trust an experienced jeweler specializing in GIA certified loose diamonds. 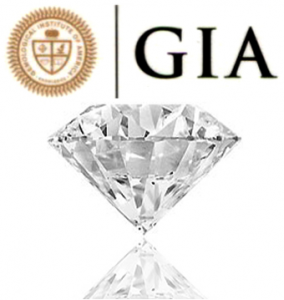 100% of our loose diamonds have Certificates issued by the Gemological Institute of America (GIA). We do not sell diamonds certified by any gemological laboratory other than the GIA. The GIA is the most authoritative laboratory with the strictest grading criteria. It is a “myth” that diamonds certified by other labs such as the European Gemological Laboratory (EGL) or the American Gem Society (AGS) are equal in quality to GIA certified diamonds but just cost less. They are NOT the same quality but at lower prices. The EGL and AGS-certified diamonds tend to be of a lower quality than the GIA-certified loose diamonds of the same grade. They are offered to you by many internet sites and brick and mortar stores to make you believe that you are getting a better “deal” by buying a similar grade for a lower price. The EGL or AGS diamond is inferior. That is why it costs less. Don’t be fooled. Contact us for a broad selection of GIA certified loose diamonds, engagement rings or fancy diamond rings. Your needs are our top priority. Read Beyond the 4 C's: What You Should Really Know Before You Buy a Diamond.